Created to be contemporary with a bold comfortable look, this upholstered accent chair and ottoman set features thick track arms with tight pulled upholstery that works its way around the sides of the chair and encompasses the ottoman with a clean upholstered look. A plump pillowed seat back and box style cushion provide comfortable support while distributing an aura of relaxed sophistication. Complete with exposed wood block legs, this upholstered accent footrest and chair set will decor homes with a high quality look of formality that is comfortable and inviting. This contemporary chair and ottoman are available as a modern furniture set as well as individual accent pieces. The 1095 Modern Chair and Ottoman Set with Plush Seat Cushions by McCreary Modern at AHFA in the area. Product availability may vary. Contact us for the most current availability on this product. 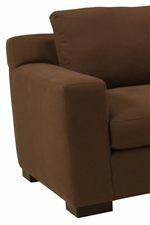 1095-OAB Plush Upholstered Ottoman 1 29" 21" 16"
1095-CAB Modern Chair 1 41" 41" 37"